Part No: UPS30005 Category: Uninterrupted Power Supplies (UPS). Tags: 18 Ah, 72 V, BP3000T, extended battery cabinet, lab, online, power inspired, uninterrupted power supply, ups, vfi cabinet, VFI3000T, voltage and frequency independent. 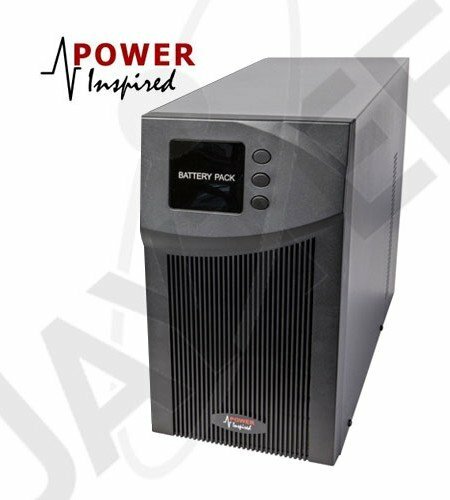 Designed for use with the VFI-T series Tower / Free Standing Uninterruptible Power Supply, these matching battery cabinets have their own integral AC charger, allowing multiple packs to be added without affecting recharge time. This model is compatible with the UPS30002 Online UPS System (compact tower format).